Tyson Fury will appeal to the World Boxing Council against the judges' decision to call his world title fight against Deontay Wilder a draw. The Briton, his face marked and his hands sore after the battle which saw him knocked to the canvas twice, said: "I've never seen a worse decision in my life. "I don't know what fight that judge who gave it 115-111 (to Wilder) was watching. That judge needs banning. He needs sacking or to go to Specsavers. Stuff like that gives boxing a bad name." The other two judges scored the fight 114-112 in Fury's favour and 113-113, making it a split draw. The judging of Mexican-American Alejandro Rochin was called into question after his 115-111 scoreline, and the fact that he gave the first four rounds to defending champion Wilder. Fury added: "I haven't seen as bad a decision since the first Lennox Lewis and Evander Holyfield fight. The world knows that I am the real WBC champion." In an unforgettable final round Fury was caught and dropped with nearly two minutes left on the clock and went down flat on his back, his arms outstretched and his bruised head resting on the canvas as he stared high and blankly into the dark void up beyond the lights. He spent a year of his life looking at the same despairing emptiness and we will never know what he saw on Saturday night that allowed him to stir. In a neutral corner, performing his patented gig of destruction, was the fearsome American Deontay Wilder and his malevolent smile suddenly vanished as he watched the impossible from ten feet away. His WBC heavyweight belt and three-months of hype were meaningless in those shocking seconds. Fury woke with a visible shake and in one smooth second flipped and pushed his way to his feet. All 18 stone of the fighting man moved from slumber just like he was getting up from an afternoon nap. At his face, leaning across his chest, the referee Jack Reiss, a hardened veteran of savagery as boxing's no-nonsense third man, simply moved back, continued his count and allowed the fallen man to become the standing hero. It was quite incredible, simply the greatest recovery ever seen in a boxing ring. Fury was up at about nine and half seconds. Wilder and 18,000 truly privileged fans gasped and hollered and dropped their heads back to howl at the ceiling. It was the final round of the fight and from the very first bell the open narrative had sucked every single one of them deep into a living, breathing, panting and punching experience. Fury had boxed the perfect fight, mixing accuracy with bravery with a bit of stupidity at times to make Wilder miss and, more importantly, to make the American think. After six rounds I had Fury up by five rounds to one; Fury won the seventh and eighth and Wilder needed a knockout. Wilder loves knockouts and 39 of his previous 40 victims had been sent sprawling and often unconscious to the canvas. Early in round nine, Fury, the fighting Gypsy King, was added to that long list of victims when an illegal right to the back of his head and a left hook to the cheek dropped him. There was pandemonium in the Staples Centre, a din of screams and mixed shrieks of joy and fright. In Fury's corner, outside the ropes and three-feet from my seat, Ben Davison, the young trainer, was calm. "Keep moving, keep moving. Jab," he hollered and mouthed as Fury glanced over. At Davison's side Ricky Hatton and Freddie Roach were standing, hoping and pulling their hands high as a signal to Tyson if he looked over. Fury had 1:50 to survive and he did, dancing, flicking out jabs, smiling as Wilder missed. At the bell, a bell so few have answered when Wilder connects, Fury raised his gloves in victory in an act of defiance. I think Fury won the round, but it would be scored 10-8 in Wilder's favour. 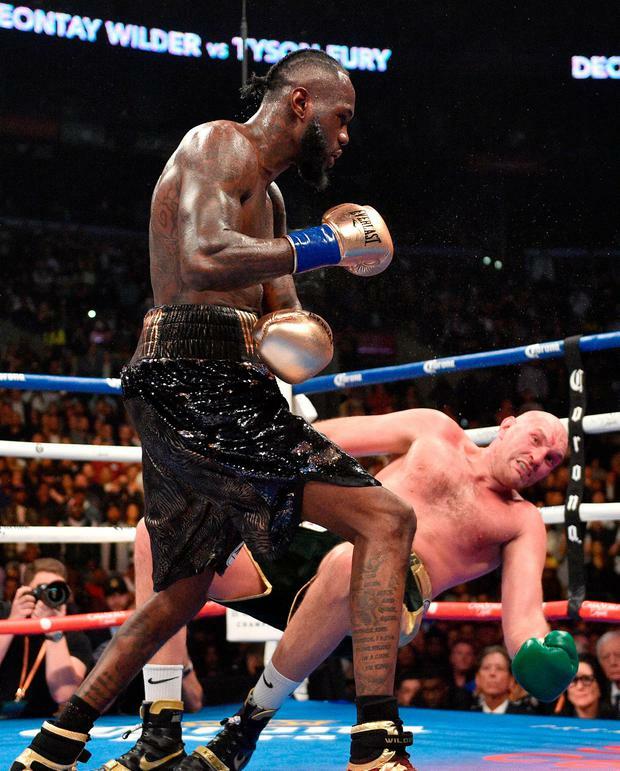 Wilder, as the tenth started, needed more than a knockout, he needed the perfect knockout, a combination from the boxing sages - he needed a clean right and then a sickening left hook. In rounds 10 and 11 he tried, but Fury was brilliant and won both rounds. That left the 12th and final round. It was an odd mix of calm and tension down next to Fury's corner and I stood, holding a rope to get as close as possible to get a sense of what the Big Lad had left. It felt, to me, that the whole arena was living the fight. It was breathless stuff. Unforgettable. Wilder found the combination --it was not enough. Once Fury had regained his feet and satisfied Reiss that he could continue, there was over two minutes and ten seconds to survive. Nobody doubted that Wilder would land again to finish the dream. Nobody was sitting and five feet from me, to my right, Floyd Mayweather, was standing and screaming advice to his friend Deontay. The ref shouted "box" and Fury, just to add to his status, moved and skipped and jabbed and recovered. Fury had no right to walk free from a year of depression and wretched thoughts and 28-stone of surplus, which was like a moving cover of surrender. Fury had no right to be that man late on Saturday night in the middle of the ring. "I did it, I did it," he said to Davison in a tender moment before the verdict was announced. There were tears of joy and relief in the ring.